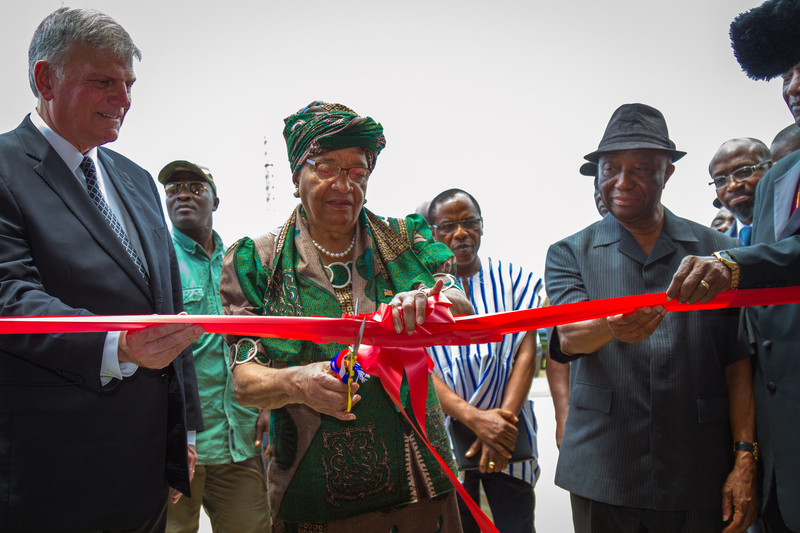 Liberian President Ellen Johnson-Sirleaf cuts the red ribbon, officially dedicating the new ELWA Hospital on Oct 22 in Monrovia. Eric Buller photo. Dr John Fankhauser looks out over the tropical, 130-acre Eternal Love Winning All (ELWA) campus in Monrovia, Liberia. On one side of the street the ELWA Hospital Executive Director sees the past - the old ELWA Hospital that was erected by SIM in 1965 to meet the medical needs of the local people. Since the old hospital opened, nearly 2.7 million people have flowed through the facility, receiving quality care in a country with one of the worst patient-doctor ratios in the world. Through multiple civil wars and most recently the Ebola epidemic, ELWA Hospital has remained true to its vision to "...glorify God by ministering to the whole person - the spirit, the soul and the body..."
But after 51 years, the hospital facilities were tired and outdated. Fortunately, on the other side of the street lies the future of ELWA healthcare - a brand new 47,000 square-foot hospital facility. 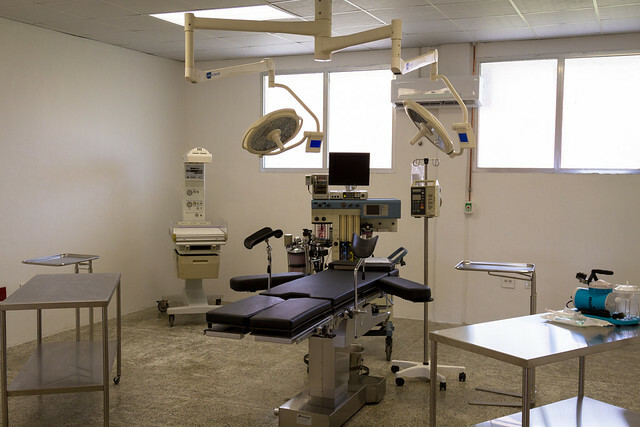 The $5 million, 87-bed hospital sits on 10 acres and represents a new era in modern medical care for Liberians. After four years of construction, the modern hospital is now complete and will open to the public this month. Though administered and staffed by ELWA and SIM, funds for the new hospital and equipment were provided by Samaritan's Purse. The new 87-bed hospital will offer a new level of care for Liberians. Eric Buller photo. Several hundred were in attendance Saturday Oct 22 to dedicate the new hospital. "The ELWA premises became the place where people ran during the Ebola catastrophe," Liberia President Ellen Johnson-Sirleaf said in her remarks. "What can we say about this facility, one that transcends everything we've wanted? It is something that compares to every other country. It is a monument to long-standing friendship and to God's love for Liberia. Though we have been subjected to calamity, we can rise up again to pursue the goal of the prosperity of our people. It gives us hope that Liberia is rising. It makes us proud." ELWA Hospital Medical Director and Chief Medical Officer Dr Jerry Brown gave a vision to the audience of what the hospital means for the future of Liberia. "Too long we have lost loved ones to curable diseases," said Brown, who served as medical director of ELWA Hospital throughout the Ebola crisis. "Let us look beyond and be courageous to provide a better and resilient health system. This structure is not going to solve all the problems. We need specialists so we don't have to send people outside Liberia to seek treatment. We should keep hope alive, this is just the beginning of many fulfilled dreams." SIM Liberia Director David Writebol thanked God for the occasion. "I hope that our gaze will look beyond the new buildings," Writebol said. "To see God's hand working through the great numbers of people who work daily in this place to bring about this historic ELWA Hospital and Ministries." 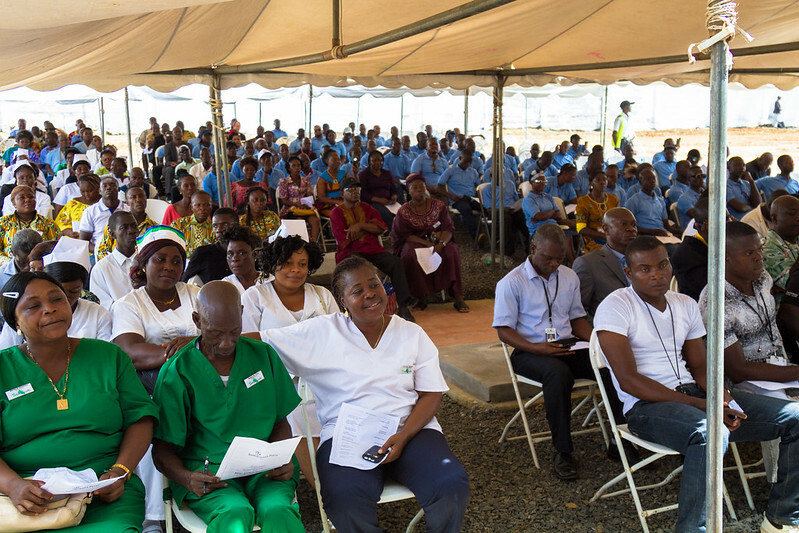 Several hundred attended the hospital dedication ceremony Oct 22, including the Liberian president and the entire ELWA Hospital staff. Eric Buller photo. "There's 50 years of history that leaves us as one of the most recognized names in healthcare in Liberia," Fankhauser said. "We're looking to provide the highest quality healthcare you can provide in Liberia and in doing so represent Christ in a way that honors him." ELWA Hospital is about holistic healing, addressing every aspect of of the patients' needs. Writebol explained how ELWA Hospital is one example of what is possible through mission partnerships. SIM is fortunate to work with key international and domestic organizations in the country, including the Evangelical Church of Liberia (ECOL), which has more than 100 churches across the country. To learn more about ELWA Ministries go here. To partner with SIM to support the work of ELWA Hospital, go here.